What foods to eat during your third trimester of pregnancy? 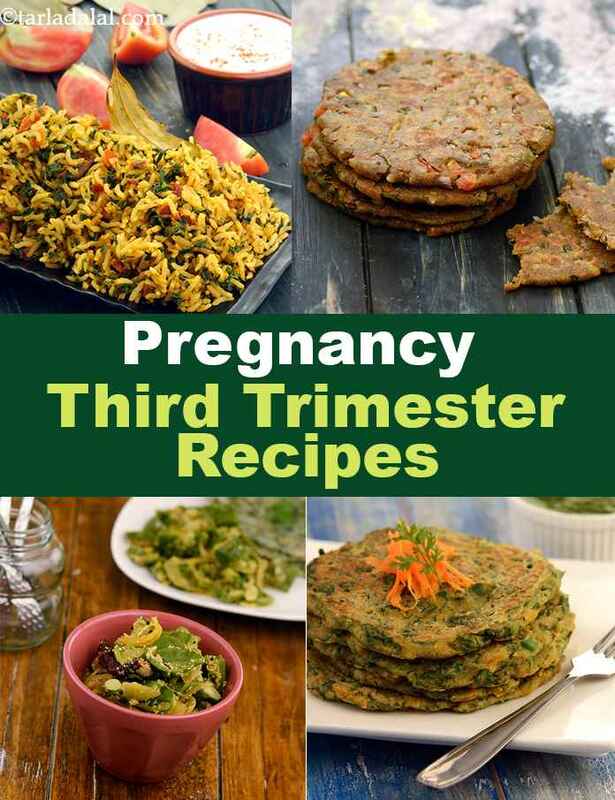 third trimester Indian foods, recipes. The countdown has begun. These last 3 months are equally crucial for you and your baby. All major growth and maturation of all the organs get completed in this trimester. Physically and mentally you need to relax, exercise well and eat well. This is the time for you to gain and stock up on all important nutrients and prepare yourself for labour. 1) Cereals and whole grains : It is recommended to consume about 7-8 servings of cereals per day. Cereals provide you the necessary energy which is required in increased amounts during pregnancy. They also provide fibre which will keep constipation at bay. Try to avoid refined products like maida. Include a variety of whole grains like wheat, barley, bajra, ragi in your diet. 3) Milk and Milk products : It is recommended to consume about 3-4 servings of dairy products per day. They provide high quality proteins and calcium. Calcium and protein requirements also increase during pregnancy to support the growth and development of the foetus. So it is suggested that you eat dairy products like milk, yoghurt, paneer etc. 4) Vegetables : It is recommended to consume about 5-6 servings of vegetables per day. Include a variety of colourful vegetables to get a wide range of nutrients. Choose all types of vegetables like leafy ones such as spinach, methi, cabbage, lettuce etc. greens such as capsicum, broccoli, peas etc, orange ones like carrots and pumpkin, reds like tomatoes and red capsicum, yellow such as corn and yellow capsicum, purple like brinjal and purple cabbage etc. Include a variety of healthy nuts to give you omega-3 fats. Nuts such as walnuts, almonds, pistachios etc. Peanuts are also a good option for pregnant ladies because they are cheap in cost. During this trimester, your baby will have become larger, leaving a little room in your mid-section for food and you may again lose your appetite in similar way like first trimester. So eat foods that are light enough to keep you feel comfortable and yet are packed with nutrients. Green Tomato Salsa and Veggie Wrap, Buckwheat Pancake, Sprouts Pulao are some nourishing options especially for you. Have small and frequent meals if you are comfortable. Juice, soup or even a salad or a small snack is a good idea. Honey Banana Shake, Mooli Muthias, Fruit and Lettuce Salad are recipes you should try your hands at then. This is also the time of gestation to add foods like garlic, methi, subza, milk etc. to your diet as they help in breast milk production after delivery. These foods are called galactogouges. To meet this requirement of a pregnant women, we have included recipes like Multigrain Garlic Roti, Strawberry Chickoo Shake etc. another recipe that can act as a galactogogue is Tomato Methi Rice in which iron-laden methi greens are combined with vitamin C rich tomatoes. So go ahead and make your pick of the day and enjoy it while relaxing on your couch. Enjoy our range of recipes foods to eat during your third trimester and check out our other pregnancy recipe categories.